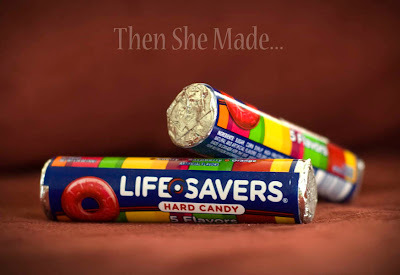 This past Sunday, Father's Day, my church passed out a roll of Lifesavers to all the dad's. I had kind of forgotten about it until this morning when I noticed the un-opened roll of treats in my husbands church bag. When I saw them I was reminded of a fun craft you can make with a roll of Lifesavers. 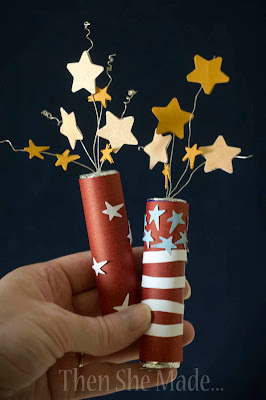 Actually, there are a ton of fun things you can do them but since the 4th of July is coming up, I thought I'd share how to make firecrackers. And, before we go any farther, I can't take any credit for this idea, I stumbled upon this idea way back in 2008 on another craft site. I did a search to see if I could remember where I first saw it but I can't find it. Regardless, it's a fun idea and worth passing along. Thank you to who ever had the original idea - it's awesome! 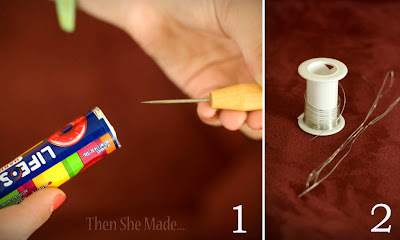 1- With something sharp, poke a hole in the packaging on each end of the roll. You want the hole to go through where the hole in the candy would be. Then set aside. 2- Prep your wire. I just cut a really long piece and then I folded it over a few times. Set that aside as well. 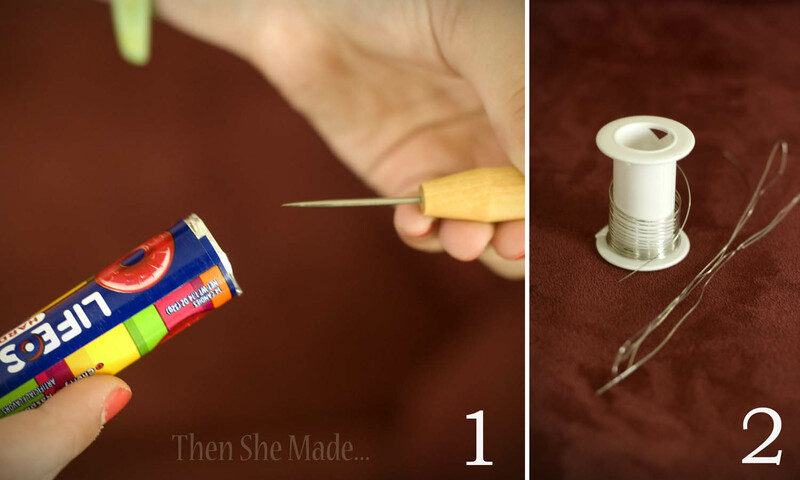 4- Take your wire bundle and thread it through the center hole. Leave most of it sticking out at the top. 5 & 6 - Once you've threaded the wire through, and most of it is sticking out at the top, turn the roll over. You should have only a small amount of wire showing on the bottom. Fold those edges over, pressing them flat up again the end of the roll. If needed you can add a small piece of tape to hold them in place. 7- Next punch out some stars and secure them to the wire. I actually punched out multiple stars so that I could "sandwich" the wire in between them. That way, if you turned a star over, you wouldn't see the wire behind it, instead you'd see another star. Does that make sense? Such a fun, each project and a great little treat to help you celebrate the upcoming holiday! Plus, if you aren't a fan of the wire, you could always use gold pipe cleaners or do like my friend did, and use gold tulle. These are so darn cute! LOVE this idea!!! I love this idea...and you could carry it on for other holidays as well...would be cute for Christmas as well using Christmas paper...fun favor at parties! Thanks for posting! Made these yesterday. A great hit for today's 4th of July celebrations. Thanks for sharing. Found you on Pininterest!